iMacsoft Video to Audio Converter for Mac is the best Mac Audio Converter and Video to Audio Converter designed just for Mac OS X (including Mac OS X 10.10 Yosemite, Mac Intel and Mac PowerPC) users. The Mac Audio Converter can convert MP4 to MP3, MPEG to MP3, OGG to MP3. It also supports converting various video formats including AVI, MPEG-4, MPEG-2 TS, WMV, DivX, H.264/MPEG-4 AVC, VOB, MOV, XviD, FLV, SWF, ASF, RMVB, RM, MKV(2 channels), 3GP, 3G2 to popular audio formats, such as MP2, MP3, WMA, OGG, AAC, M4A, WAV, AC3, AMR, RA, AU, etc. The converted audio files can be played on different audio players, such as iPad, iPod shuffle, iPod nano, iPod nano 5G, iPod classic, iPod touch, iPhone 3, iPhone 4, iPhone 5, iPhone 5S/5C, iPhone 6/6 Plus, and regular MP3 players. This excellent Mac Audio converter provides more parameters, like bit rate, sample rate, frame rate, audio encoder settings, and audio channel to set for personalized conversion. Additional, batch conversion can make your operation more easily. The Video to Audio Converter for Mac is very easy to use. With its user-friendly interface, you can convert video to audio on Mac fast and easily. 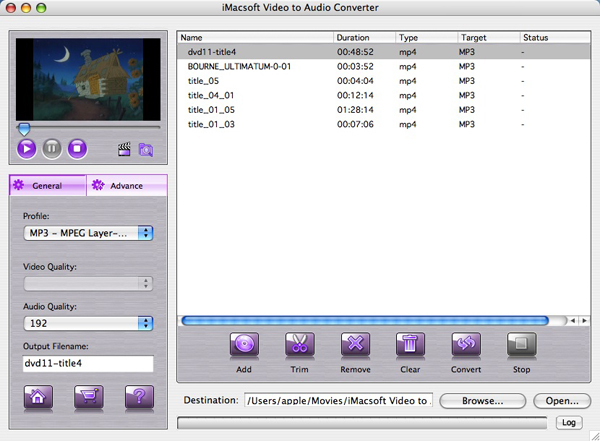 Download iMacsoft Video to Audio Converter for Mac for free and have a try just now! How to convert MP4 to MP3 audio files on Mac? How to rip video files to MP3 on Mac?